Modern style meets DIY cool in this sturdy cedar sofa! With just some 2x4 boards, you could be seating in style this summer! Click here to download Ana White's blueprints for this How-To! Cut Your Boards: Cut all of your boards according to the cut list. A circular saw, chop saw, or compound miter saw is recommended for cutting. Build Seat Frame: To make the seat part of this sofa, we are basically going to frame up a mini floor. Just attach 5 of the 25-1/2” long 2x4s to 2 of the 72” long 2x4s, spacing about 16” apart. Use 2-1/2” exterior decking screws. This completes the seat frame. 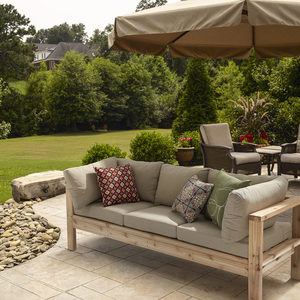 Arms: Attach arm rests (28-½” long) to legs (25-½” long) with 2-½” exterior decking screws. Build two arms. Arm Middle: Attach another 25-½” long board to the center of the arm, 14” up from bottom, with 2-½” exterior decking screws. Arm Tie-In: To finish the arms, add another 25-½” long board underneath the arm middle. We’ll use this board to tie into the seat framing in the next step. Attaching Arms to Seat: Attach the seat framing to the arms with 2-1/2” exterior screws, through the arm tie-in boards. Seat Slats: Attach seat slats to seat support frame, with 2-½” exterior decking screws. Back Support: Attach the final 72” long 2x4 board to the tops of the arms, at the back. This time use a pocket hole jig set for 1-½” thick boards, and 2-½” long pocket hole screws. What size cushions will fit this couch? The cushions in the image seem be be of different sizes. Thank you. You can use 24 x 24 inch cushions for the bottom or 25 x 25" (which will be just a smidge big, according to what Ana White said on one of her videos). @DIY_Diva we have fixed the links. Thanks for letting us know! @ahmed-omran2018 did you try clicking on the hyperlink that says "click here". It's working on our end so you may want to try a different internet browser. @MrsAjj - The cushion size depends on how large you decide to build your couch so measure yours to be sure. We used cushions like this from Home Depot for ours: http://www.homedepot.com/p/Hampton-Bay-Woodbury-Textured-Sand-Replacement-Outdoor-Sofa-Cushion-JY9127-S-CUSH/204378799. @DIY_Diva - We only have a finished image for this project. The video has all the step by step instructions. I hope this helps. Finished product looks great. A two and a half minute video is not a downloadable plan. Too bad you guys don't have a step by step like Ana has for all her other plans on her site!! step by step is some one else doing the thinking for you. we should be able to take a picture with the size of all parts and do great. What good is it to me if some one else does all the work, then I've learned nothing. Hi, Ana. I hope you feature this design on your website with the sketchup illustrations. Those step-by-step instructions are much clearer than the text-only procedure written here. S.
I cannot see any pictures or how to download this project...would love the plans and instructions with photos? MATERIALS USED: is a list of all the parts, a video to view over and over, and step by step instructions. All we need now is some one to say over and over " look what I made"
I made a version of this today and I am very happy with the finished product. Thanks for the plans!! Since this is an outdoor couch, do you have instructions on how to weatherproof the wood? I can't wait until I can make this for our deck! Couches and other patio furniture is so expensive and made cheaply! Time to measure out a matching side chair or two! Excited. It is my next project after planting season is over! This is very nice. I would like to make this couch without arms, yet have slats in the back any suggestions? Have you pre drilled guide holes before each screw? Do you recommend doing such, or can i pass on this? Made 2 of these the other day. Took me about 5 1/2 hours from start to finish (for both). That's for 1 person doing everything on the ground. These are absolutely BEAUTIFUL. Everybody loves them. Now we just have to finish (protect) them, and make some cushions for them. I added 1 more 2x4 to the back, just under the top rail. May add 1 (either 2x2 or 2x4) along the seat to keep the cushions from going out the back. Thanks Ana. Built it! Love it! Can you share any info on the cushions that fit best with it?! Karlah, they were so expensive! Hah, the cushions would have cost just as much as a brand new seat with cushions, kind of frustrating. But it looks cute and homemade so oh well. We used the cheapest we could find from At Home, the ones that included the top and bottom as one, and had to add some extra throw pillows for added comfort since the back seems to dig in when you sit! Still enjoy it though. Wish she would include the measurements of the cushions she used so it would have been easier to find. They may be custom as the standard cushions fall a little short. Considering this! Standard outdoor cushions? How many 2x4's planks should be purchased? Hi, Greg- There is a link just before the steps that allows you to download the plan, including a shopping list. According to that list, you'll need 11 2x4x10's. If you build the couch, we'd sure like to see it! Just finished the frame - love it! Any recs on good places to find cushions? No sanding or water sealing of the wood? Hi, Karlah! 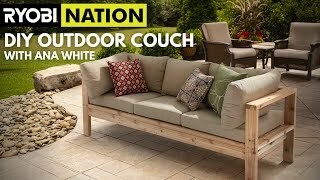 The Home Depot carries a variety of outdoor couch cushions, and there have been a handful of folks who have put together their own! Hi, Nuck82- Sanding and especially sealing is a great idea for this project. The Home Depot carries a ton of choices for outdoor wood treatments. Hi!...My daughter and I just built this!!! !...For our first time, we did awesome!....The only adjustment I made was that I made it the size of a twin bed ...So my bottom cushion is actually a mattress!...But great plan, great instructions !....On to the next project!!! I built one of these couches. I made some modifications: (1) Moved the rear beam back 6 inches and added 2 vertical supports. This allows me to use seat cushions for the back instead of pillows. (2) Added some diagonal supports to connect the legs to the center frame for rigidity. (3) Used plywood for the seat instead of 2x4s, was going to add hinges so I could swing the seat up to store stuff under it, but just screwed it down instead. I would like to upload photos buy I dont know where to do that. I am not able to download the blueprint as it keep saying site is not available. @ahmed-omran2018 we have fixed the link. Thank you for letting us know! Is there a way to download the plans? @dickblazer we have fixed the link so you should be able to download now! I built this over the weekend. I'm pretty happy with how it turned out. I made a couple minor modifications. I used 8 foot boards instead of 10 (I have a tiny hatchback). I still only used 11 pieces of lumber, I just made the smaller slats 24 inch (instead of 25.5) so each board was one big and one small and I made the 2 medium boards 27 inch. I also put the back board vertical instead of horizontal for a little more support, I don't see any reason why to make it differently, its still deep seating and fit standard cushions from Lowes. I made mine in redwood which looks very pretty with all the different colors and patterns in it. Nice! Thanks for sharing! Be sure to create a new project and upload images so we can see how great it turned out! Made this couch earlier this week for my screened in patio, I am SUPER happy with it. Cushions arrived yesterday so its finally complete! Thanks Ana and Ryobi. having trouble finding where to download the plans for this?